We are embarking on a journey to take a normal ranch style home from the 20th century into a home that will embrace the 21st century while showcasing both mid 20th century and older fine pieces of furnishings as well as art. We have signed the papers and are now the proud owners of this dated rancher. The lot is ho hum nothing special, except for the expansive views of the Indian Creek Golf Course. 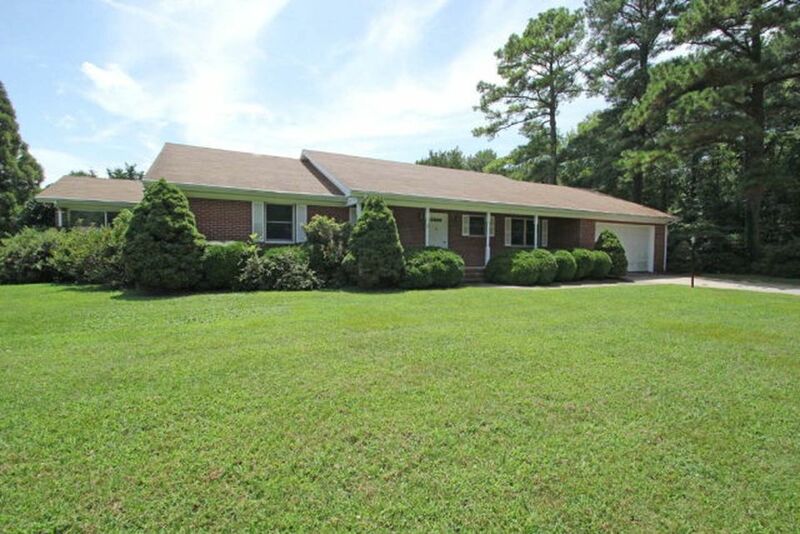 This takes just under a half acre and makes it feel like a well groomed estate. All the better because the majority of what we see we do not have to keep up. The giant over grown bushes are all gone, and the house has had a coat of white wash as well as new paint on the shutters and doors. Lewis has planted the yard as well as a shade garden on the side where we get little sun. Every morning we have our coffee on the sun porch watching the sun come up over the golf course. 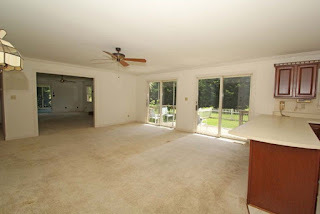 When we walked into the house we were surprised to see that in spite of the ho hum exterior that there were large open areas to the home. 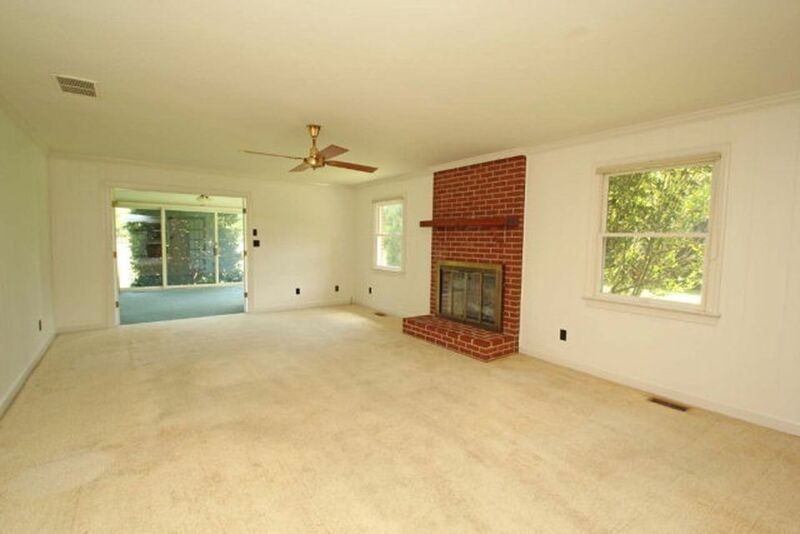 If you look carefully you can look into the living room and then into the sun porch. In the next photo you will see that the entrance is large 16x6 feet. There are great plans already in the mix. These lighting fixtures are coming down, as well as taking up the nasty rug. 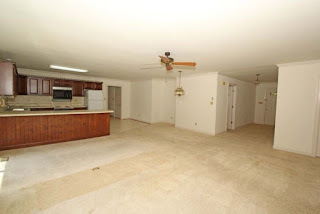 We will be taking out the kitchen as well, and putting down re-purposed hardwood flooring. The front entrance will have some brick paver accent flooring. 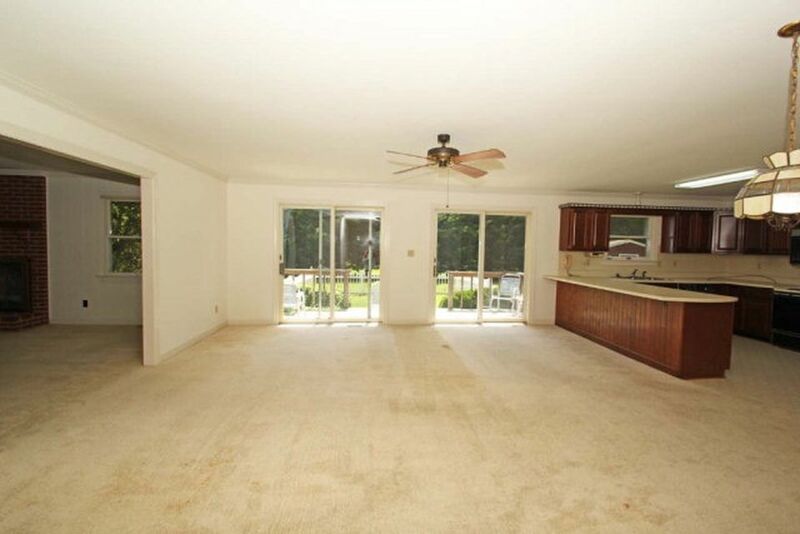 The walls are painted paneling. We are hoping to find some ship lap to use here. We will be redoing the fireplace and taking down the fan. Up with the rugs here and throughout the house. You can now see the sun porch below. The rug here is not as bad as the rest of the house, but we still plan on ripping it up and the window treatments were not cheap, but no to those as well. 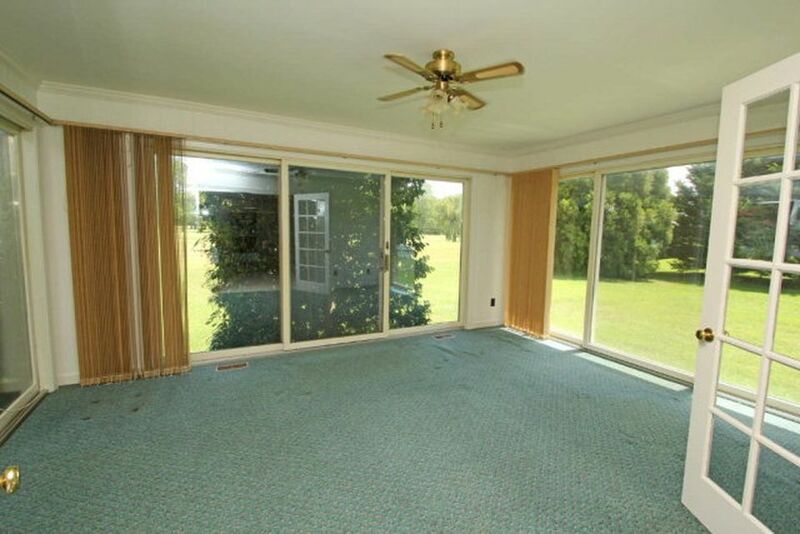 The last residents were smokers and the smell and nicotine stain on the window treatments need to go. All and all the house is open the entire length of the building. We will not feel confined at all here. This is the beginning I can not wait for the finished home. 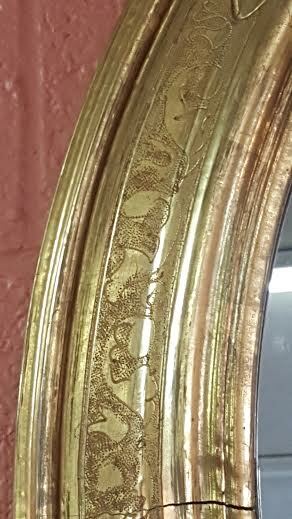 There are a lot of frames that claim to be gold leaf. 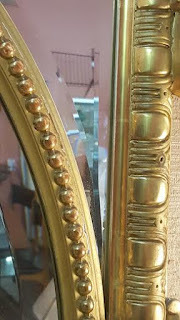 Knowing what you really have in front of you when you go to buy a piece is being able to see into the piece.What is gold leafing and what is water gilt? 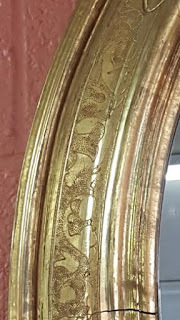 Most frames that you will find today are merely "gold" leaf, and most of these are done with imitation gold leaf which is actually very thin brass leaf. The same goes for silver leafing today which mostly is aluminum leafing. Years ago my father did gold leafing and I remember going into his shop and seeing tiny bits of powdery gold fluttering in the air. These were the tiny pieces that did not adhere to the frame. Gold leafing is the layering of a tissue thin sheet of gold over a surface. The surface needs to be prepared with a sizing and the the leaf is gently applied on to this surface. Today this is usually an imitation gold leaf. 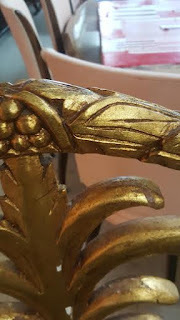 When this is used the piece needs to be varnish to retain the gold sheen. Older gold leafing was done like this but with real gold leaf. Water gilding differs greatly from gold leafing. 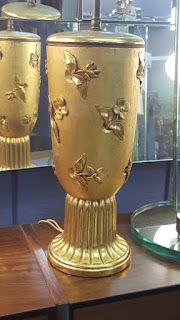 Water gilding is gold leaf that is applied over Armenian clay, or red gesso, referred to as a bol. 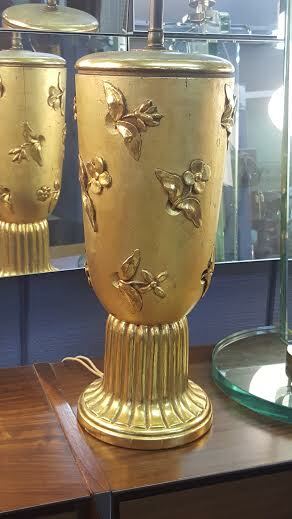 The gold leaf is then applied very delicately as the real gold leaf is very thin and can easily blow around. Once the gold leaf is applied then an agate tooth shaped burnisher is used to burnish the gold itself. This gives the gold a luster and sheen that you do not find in regular gold leafing. Born in 1880 in New York , Eugene Schoen, studied architecture at Columbia University and graduated in 1901. He traveled to Europe and studied architecture with Otto Wagner and Josef Hoffman. He attended the Paris Exhibition des Arts Décoratifs et Industriels Modernes in 1925. 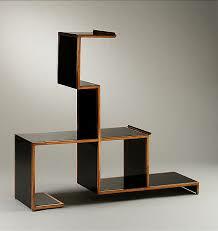 Greatly influenced by what he had seen he started designing furniture after the French avant-garde style he had seen there. He opened an interior decorating business and designed the furniture himself. He was able to combine the new materials that were coming into the market place with the more traditional materials and woods used in Art Decco Designs. Designing and selling furniture during the Great Depression was not an easy task. He was able to display his furniture in his own shop. 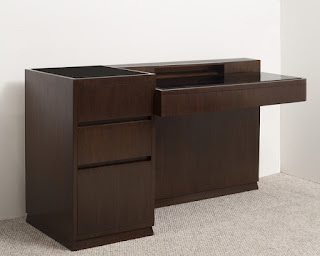 Schoen exhibited furniture at the Pennsylvania Museum of Fine Arts and participated in two exhibits of industrial design at the Metropolitan Museum of Art. This helped get him through the depression era. In 1931, Schoen became professor of Interior Architecture at NYU. He designed furniture for Schmieg & Kotzian, Inc., Designers and Cabinet Makers, 521 East 72nd Street, New York along with Paul Frankl. Schoen recieved the Gold Medal Award of the Architectural League of Crafts. His designs led the way for other modern furniture designers.